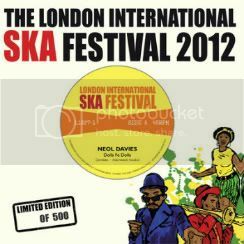 The London Intl Ska Festival 2012 proudly presents an exclusive series of 7″ collectors vinyl. 4 brand new tracks from Neol Davies (The Selecter), The Dualers, Dave Barker (Dave & Ansell Collins) and Phoenix City All-stars) on 2 ltd.edition 7″s. Only 500 numbered copies of each one. Only available at the ska fest and www.londoninternationalskafestival.co.uk/shop Grab yours quickly as they are going fast! !